Drumheller Fountain | The Happy Wonderer ~ ellen b. 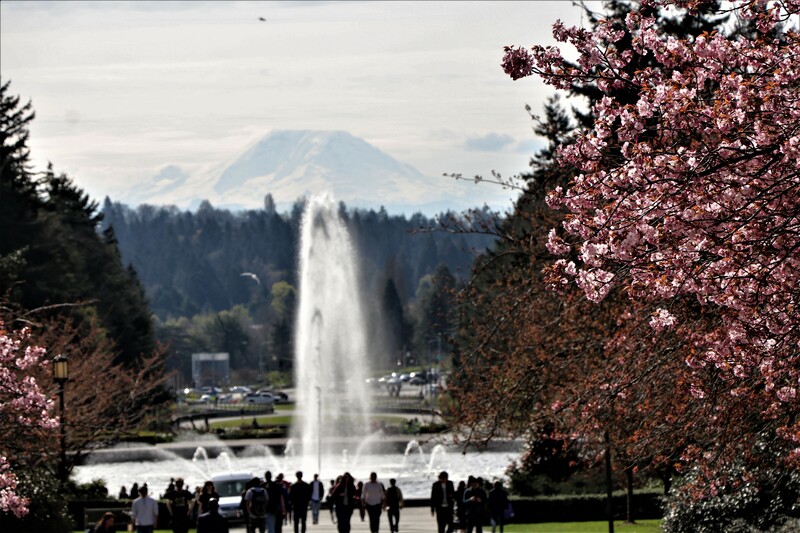 When our daughter-in-law and I arrived at the University of Washington a couple of weeks ago to see the cherry blossoms we first looked towards the Drumheller Fountain and the Rainier Vista beyond it. 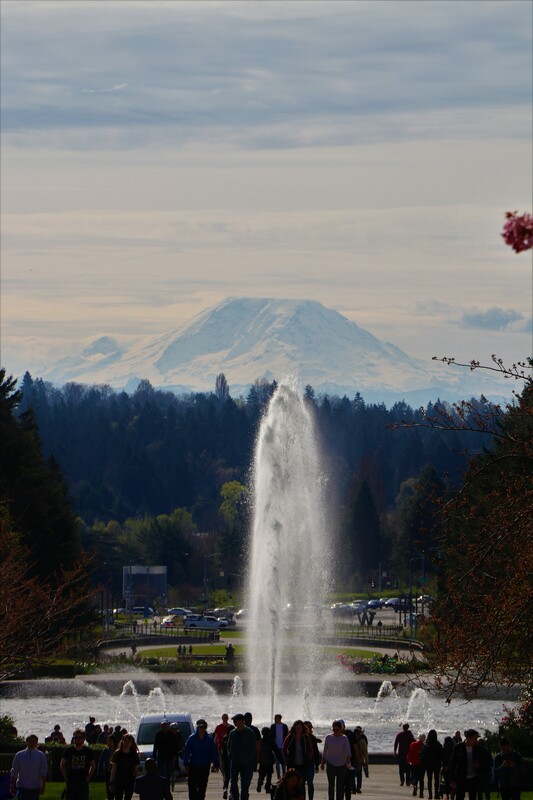 We were very excited to see that Mount Rainier was not shrouded in clouds as is the case on many days. 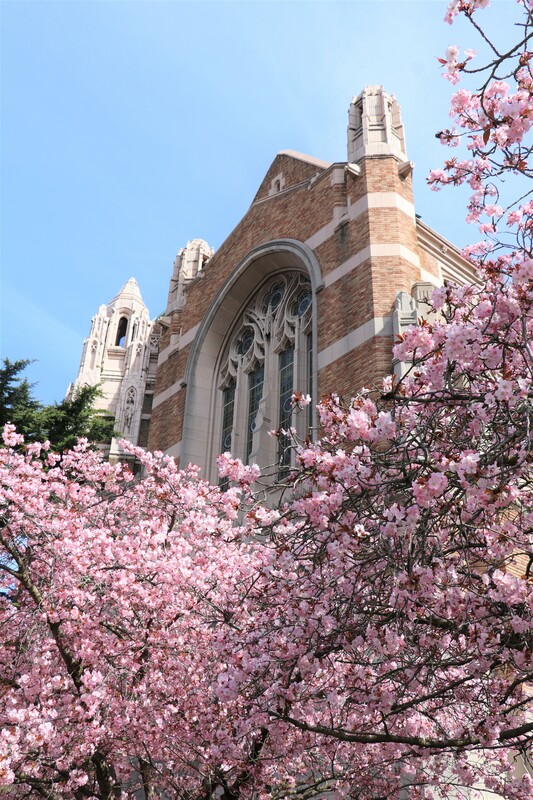 I’m glad we stopped to take photos before we continued to the Quad to see the blossoms. 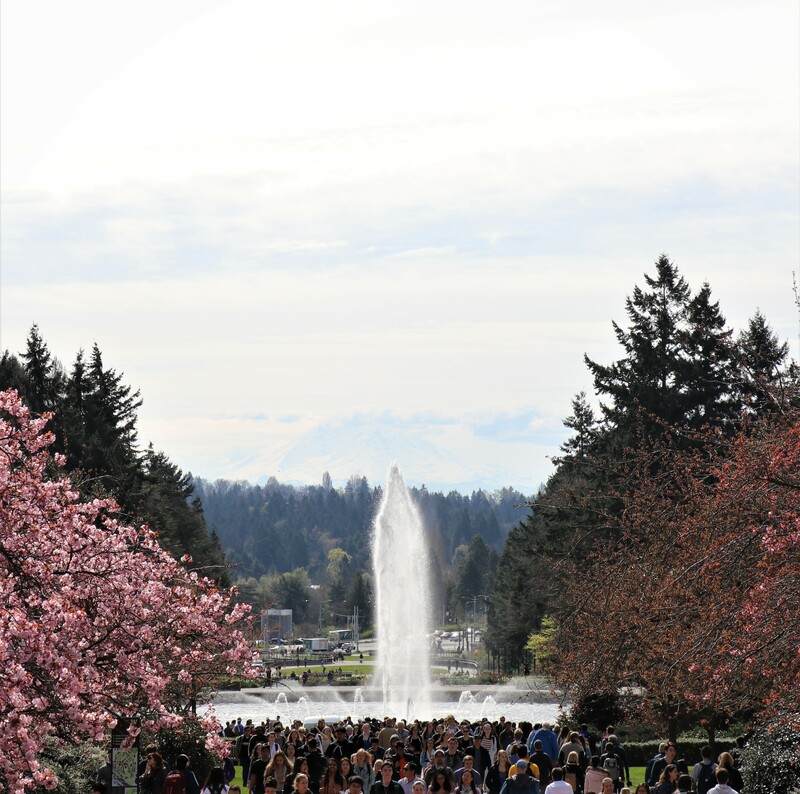 When we were done with the blossoms and headed back to the parking garage, Rainier was hiding but all the students were out in full force! 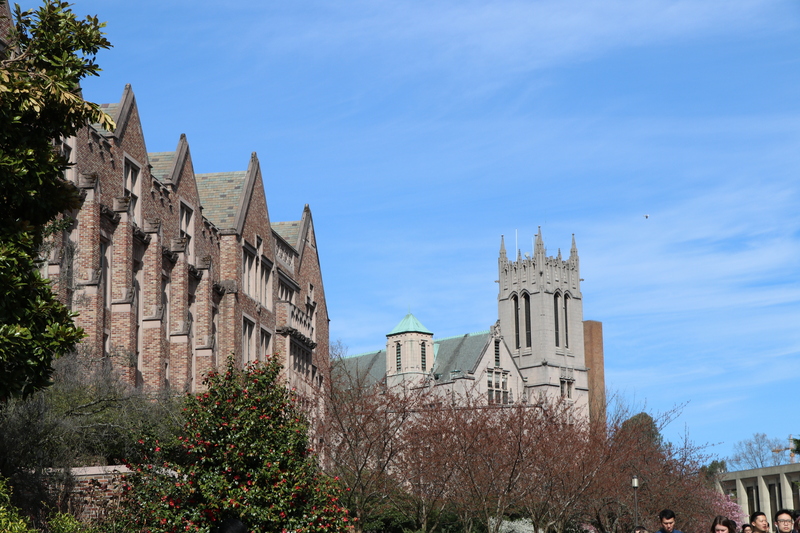 I took a couple more photos on the way to the parking garage. 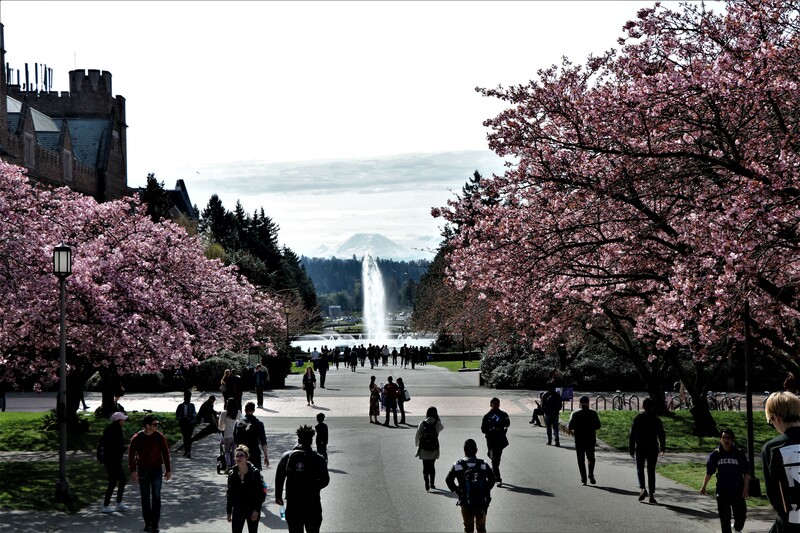 It was a photo fun day at the University of Washington. It’s time for me to admit that the days are getting away from me in this Easter season and with the short amount of days until our wee grandson makes his appearance. We’ve had a few more babysitting times so Mommy can get all her doctor visits in and mommy and daddy need to go out for a special date before they have a toddler and a newborn. Our Coast kids are arriving soon to be here for BBB’s delivery. And then there’s Spring cleaning, especially on our property. So if you don’t see much from me or you don’t see comments on your blogs from me you will know why. The times they are a changing and it seems changes are something we can depend on more and more at this stage of life. Hebrews 13:8 (ESV) ~Jesus Christ is the same yesterday and today and forever.